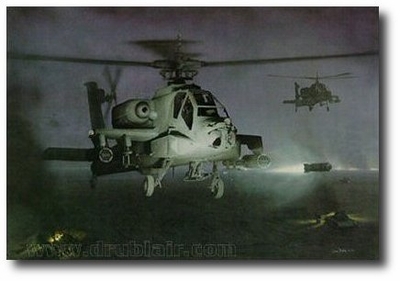 An "Operation Desert Storm" Commemorative Lithograph. In "Hellstorm", the sudden flash of the lethal Hellfire missile illuminates the hidden form of an AH-64 Apache as it unleashes a rain of destruction deep behind the lines of the Iraqi forces. A superior night-fighter, the Apache is regarded as the world's best attack helicopter, and armed with the Hellfire missile, can defeat any known armor. "Hellstorm" depicts an actual engagement during "Operation Desert Storm," and is accurate down to the track patterns in the sand. A distant tank battle illuminates the horizon, and the remains of a ZSU and Soviet T-72 in their revetments serve witness to a previous encounter with this Apache. 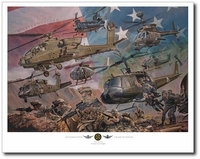 The second release in Dru Blair's Army Aviation Art Series, "Hellstorm" is reproduced on Acid Free Museum Quality Archival Stock, and each lithograph is individually inspected and signed by the artist.